At a tradeshow or convention, first impressions matter. No matter what industry you work in, you want to make sure you always look your best when speaking to customers. Having an impressive display helps, but you want to make sure you dress to impress. ePromos has a broad collection of customizable shirts and accessories that help you feel confident. Browse our catalogue of customized polos, dress shirts, and more to make a memorable first impression. This unisex custom polo shirt is made from a cotton/poly blend. The DryBlend fabric of this logo polo shirt wicks moisture away from the body. Nothing's better for chilling out than your favorite zip-up custom hooded sweatshirt. Give clients and employees these Harriton easy blend custom polo shirts for great apparel they will love to wear. Upgrade your company apparel with these Harriton easy blend custom polo shirts that employees will be proud to wear. 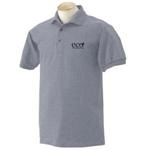 Made of 100% polyester, this custom polo shirt features mesh ventilation in the back, making it perfect for those hot summer days. A classic 6 oz. custom polo shirt made of 100% preshrunk heavyweight cotton jersey. An amazing cotton custom polo shirt at an exceptional value. This ultimate cotton custom hooded sweatshirt features set-in sleeves and a front pouch pocket. A cozy, no-nonsense custom hooded sweatshirt. Trade shows let you learn about what's new and innovative in your industry. They're also a great place to find new clients, which is why it's important to make a positive impression. Sure, having a flashing table is a great way to draw crowds, but how do you keep them? Having the best-looking booth in the world won't mean anything if you don't look credible. Wearing a shirt, hat, or hoodie with your company logo on it is an important first step in positively representing your brand. Not only will it make your reps easier to identify, but it gives them an air of professionalism as well. Trade show clothing is also a great way to show off your corporate culture, and ePromos has apparel fit for any brand. From button down dress shirts to athletic wear and casual hoodies, we've got you covered. We offer apparel in a variety of colors for both men and women, making it easy to match your brand's aesthetic. Contact our brand consultants today to create something that helps you stand out. The next time you take the trade show floor, you'll do so in style.